City of Dubrovnik is the southernmost Croatian city, which is certainly the most well known for its tourism and historic wall. There is several legends about foundation of this city. Historically the most correct explanation is, that the city of Dubrovnik was formed after the collapse and destruction of the old Roman city Epidaur. In the territory of the town, the city of Dubrovnik was formed, and was slowly developing until it became the capital of Dubrovnik Republic, which was overwhelmed in the 1808th. 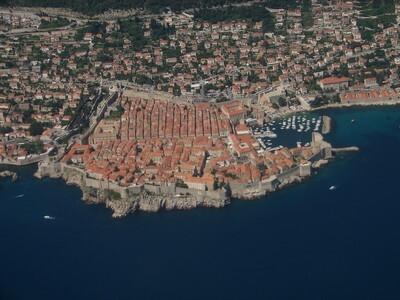 However, Dubrovnik was an independent for more than 500 years, and had quite a lot of territory under its authority. In the year 1333, Ston on the Peljesac peninsula, and also many islands in the Adriatic were under the authority of the city of Dubrovnik. Dubrovnik is certainly best known for its defensive walls, which were built between the 12th and 17th century. The old part of the city is almost all surrounded by almost 2 kilometers long wall, which is up to 25 meters high and up to 6 meters thick. Complex defensive structure is today still considered one of the largest in Europe, because a wall was on the weaker points strengthened with the heavily fortified towers and fortresses. There were about 120 cannons and a deep moat around the wall, so the defence was perfect. Today, Dubrovnik is a popular tourist town, which every year attracts many tourists who enjoy vacations in the beautiful Dalmatian town. The city offers many opportunities to tourists for its historical and cultural tours, swimming in the clean and warm sea and enjoying good food and Dalmatian wines. It is also important city for all inhabitants of Dalmatia, as it is the main administrative, commercial and educational center in this part of Dalmatia, and also a start point for many different ferry routes, both in Croatia as well as in Italy and elsewhere.